About 500 years ago Shakespeare wrote the tragic play- ‘Hamlet’. His tragedy emanates from major personality flaw- indecision. Indeed, the drama exaggerates the flaw and the hero suffers a disaster. This malady is, however, more wide spread in the current scenario. The acute competition & the rat race of the present times have made fear of rejection more prominent than ever before. The gin of fear is causing tremendous stress to most people. Four steps are listed below that will help mitigating the fear which is main cause of indecision. Always remember that ‘left to themselves things go from bad to worse’. This you must have experienced in life. So the very memory will wake you up from the slumber and you will try to find a solution to the pending problem. 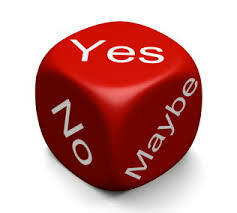 Surely, you will need to take decision about the action you need to take- sooner than later. Get yourself motivated to ward off the indecision, thus. Whenever their some important project, you may write down the problem in detail. Now, think about the possible solutions. Then note down the pros and cons in respect of each. This will help you to decide easier and faster. But never fear about wrong decisions. Some decisions go wrong for everyone. The more you start taking decisions, you will find that incidence of wrong decisions will reduce. Your indecision could also be because of lack of adequate knowledge about the subject. Instead of worrying about what will happen if decision goes wrong, work hard to gain the required knowledge about the subject. The moment you know the subject well, you will find, it’s easier to decide. Fortunately, we have Google and other sites which instantaneously provide sufficient information on any subject. And if you are a habitual procrastinator, you must at once say to yourself that your habit has let you down on earlier accessions. You have suffered earlier. Therefore, you would not like to repeat your past mistakes. Procrastination is a disease. It needs to be eradicated from life. Whatever is necessary; you must do to cure the deadly disease. There could be some more causes which each of us should identify fo himself/herself and then work on these. But indecision should not be allowed to hinder your progress. This entry was posted in Personality development and tagged Acute competition, Adequate knowledge, Decision, Drama, Google, Indecision, Motivate to take a decision about the action, Personality, Present Times, Pros and Cons, Rat race, Shakespeare. Bookmark the permalink.